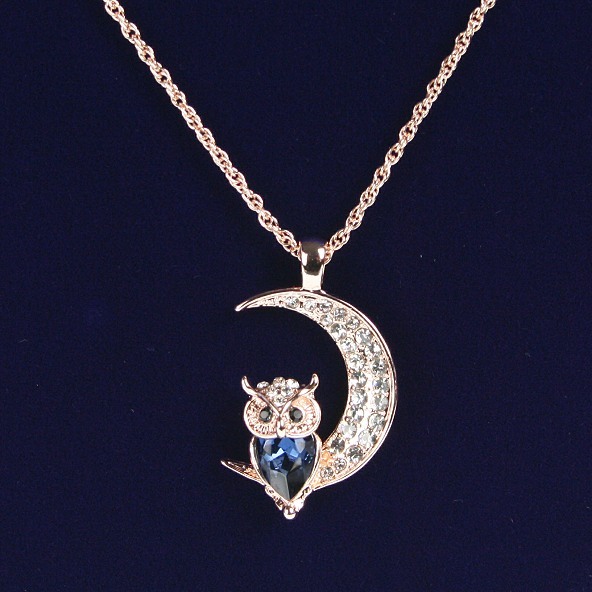 A pretty, rose gold owl and moon necklace by Indulgence with an owl containing a beautiful blue stone sat on a diamanté moon. A hooting gift for collectors of this popular bird! A stunning owl and moon gold brooch (by Indulgence) with a beautiful deep blue stone and a half moon covered in sparkling diamanté. Extremely charming silver plated owl necklace with charm suspended on a fine linked chain. A stunning large diamanté owl keyring with black eyes, raised tummy and flat gold open filigree on the reverse. A smart owl scarf with amusing large owl's design on a mottled pink background.